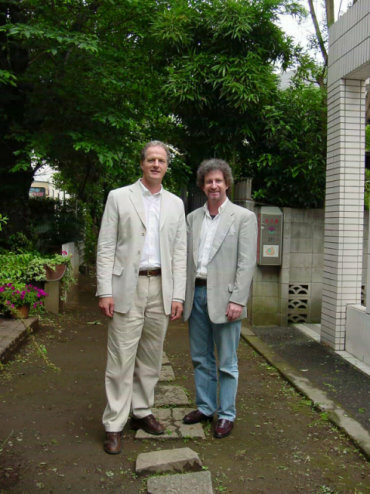 Robert Yellin (R): How do you feel being in Japan for your first exhibition? Mark Hewitt (M): I have many feelings. One is that it's a great honor. 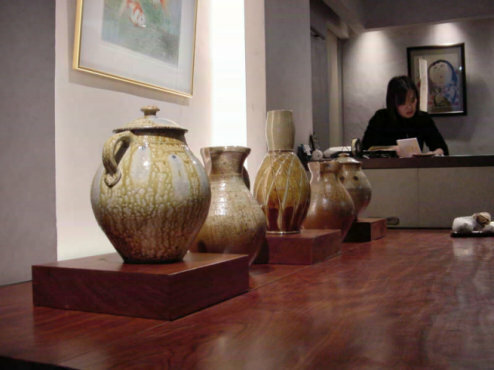 It's clear the Japanese have a sensitivity to pottery that is unequaled. I could tell wandering around the museum (The National Museum) by the expressions on people's faces as they looked at pots. I also feel very much as though I'm the "new kid on the block," which is a feeling I haven't had for a while because I'm established in North Carolina and my openings are very very busy and by now everything would have disappeared! R: A little humbling maybe? M: Yeah, it is a little humbling. Yet, it is better for me because I know how long it takes to establish a reputation somewhere. R: Do you feel as if your pots are being tested against old Japanese ones? R: Do you also feel that clients here will look at your work with a more critical eye or sensitivity to use? M: Yes, I that think there are different ways that people use pots here and different expectations that people have for what they want around them. An American context is slightly different so the things I'm accustomed to making are a little more outside of the Japanese context. But I feel that's a challenge, it's as much a challenge for Japanese users who can get trapped into a very rigid set of use criteria. R: Right, right, particularly your "Ice Tea Ceremony" vessel, I really think that's going to trip people up. I think it is challenging to have Japanese see their relation to mingei in a wider different scope from the south (the Southern USA where folks sip a lot of ice tea). M: Yeah, I think the thing about mingei was that is wasn't just about Japanese folk art. 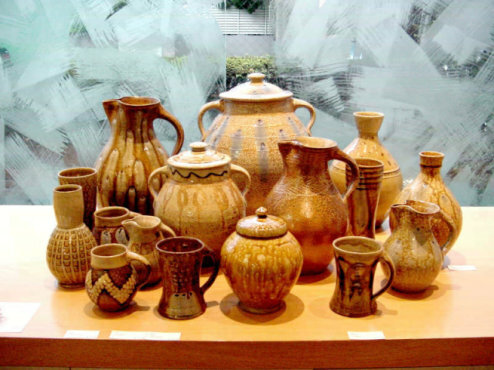 It also included English slipware, folk pottery from Spain, Windsor chairs, it wasn't all Japanese derived. R: But don't you think it was the Japanese who crystallized the theory of it? R: Referring to what you wrote in an essay a few years back, you said that "Tradition is radical" yet in Japan tradition is somewhat static. I think it should be a bit radical for that's where great ideas come from. However, when you become a 14th generation potter like some in Japan there's only so much radicalism you can take on. M: Well I know that talking to Jeff (Jeff Shapiro, an American ceramic artist) for instance, the Raku heir is making the most wonderfully radical pots. M: So tradition can still be radical even after fourteen generations. But a lot of those slogans (referring to the essay) were put together for shock value because people think that tradition is very calm and sedate, and I think tradition contains elements that are very explosive and very counter to contemporary art values that really need to be examined carefully. R: You wrote that tradition is individual. R: But it's an individual working within something that has come before them, sometimes it's a hundred years, sometimes a thousand. So, how can a person make tradition an individual thing when you're working within something that is so set in its complex ways? M: Well that's again coming back to the young Raku artist. He's able to crystallize everything that has gone before into a moment of creation. R: He again is an exceptional case for he went outside of Japan and studied sculpture in Italy. R: So he stepped out of his tradition. M: But I still think that's legitimate though. M: It still belongs to the tradition. Tradition isn't reproduction. Tradition is excellence and you have to ignore sloppiness and ignore repetition and ignore easy thinking. R: But isn't repetition tradition in a way. M: Yes, but repetition is still a moment in time and if you can allow your thoughts to be creative and pure each time you repeat yourself, each repetition is fresh and new and allows for great refinement. And I think that refinement is radical too. R: Where do you find your hints for refinement? What traditions where you're at sustain you? M: Well right now I love North Carolina pots. I live in North Carolina and I've gone out of my way to make an exhaustive study of N.C. pots. Some of them are magnificent and don't fall within a Japanese ceramic context at all, although there are parallels. The groundhog kiln, for instance, is the traditional woodfired salt-glazed kiln and is very much like an anagama kiln that produces fire-marks that are very like anagama firings. 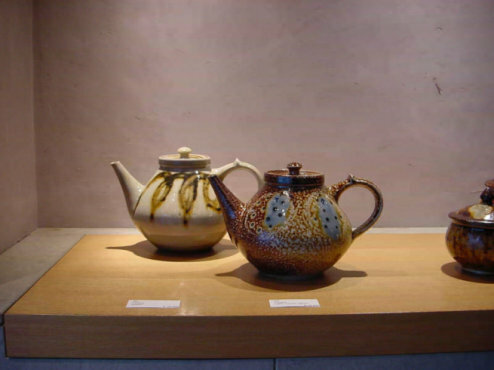 The clay quality is different, but just as excellent, and the results tend to be gray-white sun-browns, blow-outs, twigs stuck in the clay, drips coming down from the kiln roof; all the elements that Yanagi, Tea masters, and Japanese patrons appreciate can be found completely independent of Japan. It is a wonderful discovery. R: Most of your materials for building your kiln, the clay, etc..are local? M: Yes, with exceptions. There are some glaze materials that I buy and I get one clay shipped in from out of state, yet it's 'as dug' and I add it as a supplement to my local clays.  R: What type of glazes are you best known for? 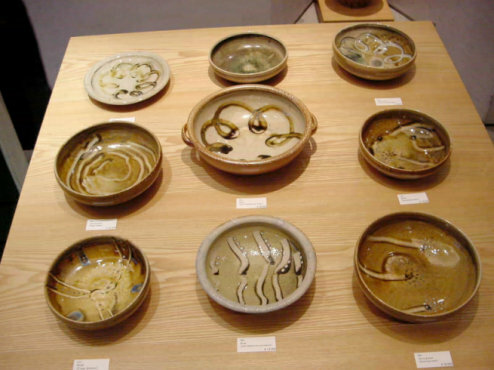 M: Primarily salt glaze, and then there's a southern alkaline glaze which is a prepared ash glaze very similar to the Naeshirogawa glaze from southern Kyushu, eerily similar. 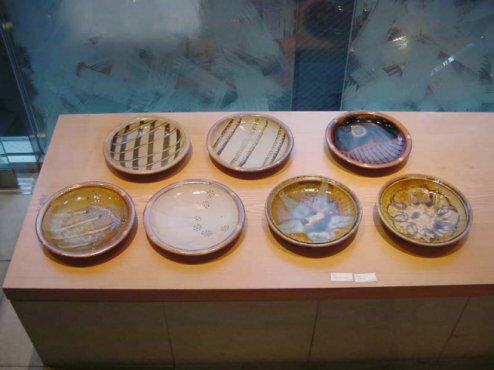 In fact, even in terms of shape, the Lincoln county alkaline glaze tradition bares striking resemblance to Naeshirogawa. R: Do you have some of those in the exhibition here? M: Yes, I do. I've got a twist on all of that which is that I add salt to everything, the entire atmosphere of the kiln is salted and everything receives that fluxing from the salt and it changes the nature of the ash glaze from a dark olive green to a sort of amber golden yellow color. R: How long do you fire for? M: Three and a half days. (A total of 1500 pieces are fired). It's five days to load the kiln, three and a half days to fire, and a week to cool. R: Do your kids help you? R: When you were growing up did you help out around Spode where your relatives worked? M: I accompanied my father to the office on Saturday mornings, mostly because on the way home we got a comic book and a candy bar! R: Is your dad still involved with pottery? M: No, he's retired. He was the sales manager for Spode and much of my extended family has been involved in the ceramic industry. I was trying to think of a Japanese analogy and it would be as though I was the son of the manager of Noritake who went to work for Hamada. R: Are they still involved in England? M: No, well, I have a second cousin who's involved in the company that my great great-grandfather set up. R: So you go back generations? R: Did your relatives have a negative reaction to you setting up a kiln in North Carolina? M: Oh yes! I was more or less disowned when I announced I was going to become a potter making heavy brown pots! R: That was in America? M: No, it started in England but that was bad enough. R: Can you tell me a little about that background? M: Well, I worked with Cardew for three years and then came over to work with another one of his apprentices, Todd Piker. While I was in Connecticut I met my wife and decided to stay in America. While we were looking for a place to live we went on a trip around the south where there is an extant folk tradition, and there were a few old-timers dotted around in very interesting places making very quirky pots. We just chanced upon our current location while there. R: So you just traveled the world and your muses led you to North Carolina? M: Well interestingly my mother was born in South Africa and her family belongs to the great British Imperial Diaspora, they were functionaries of the British Empire. Her father was a banker who was born in India. His father was an indigo planter in India who was born in London. His father was a lawyer born in Scotland, and his father was the Sheriff of Skye! The sheriff was the estate manager for the Lord of Skye. So, I have traveling genes on one side of my family and pottery genes on the other. So to end up in North Carolina making pots makes perfect sense! R: In a way it sounds a bit like Hamada's way of finding his place. In the beginning he was an outsider and people wanting nothing to do with him. Did you find that same attitude in the beginning in North Carolina? 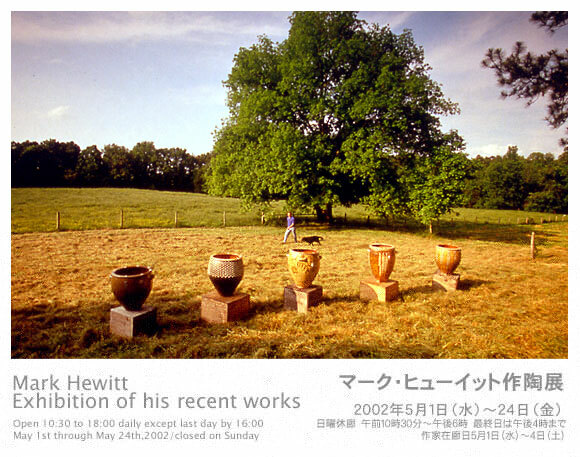 M: Quite the contrary, the folk potters knew of Cardew. 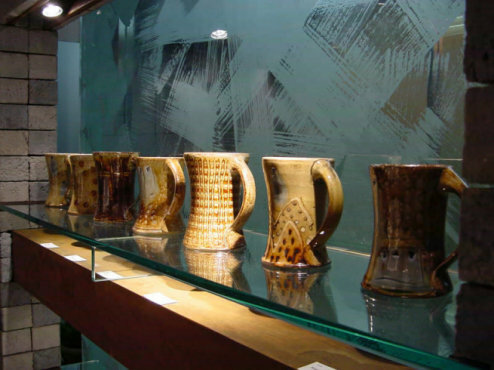 In fact, Vernon Owens who runs Jugtown, which is the most famous of the North Carolina folk potteries, visited Cardew in England several years before and Cardew actually had an Owen piece. Usually when Cardew was given pieces of pottery by visiting potters they would end up in the creek! Yet this piece of salt-glazed North Carolina pottery was given a minor yet fairly significant spot on the Welsh dresser in the big room in a sort of dark hidden corner. That's where it sat and was pulled out to be examined from time to time. R: Did you notice it then? M: Oh sure, but it really wasn't until after I was in North Carolina that I remembered it. So, Vernon has been extremely kind to me in terms of giving me advice about clays, loaning me pieces of equipment, and being an encyclopedia of knowledge about the local scene. R: How long have you been there now? M: Nearly twenty years. When we first moved there, there were only nine potteries (Mark is referring to Seagrove, a town not far from his), five of which were the old family potteries; the Owen's, the Cole's, the Teague's. And now there are about a hundred potteries. Most of those people have come from outside and bring with them styles that have nothing to do with the old North Carolina traditions. You don't have many people like you do in say Mashiko making just straight of Mashiko-yaki. 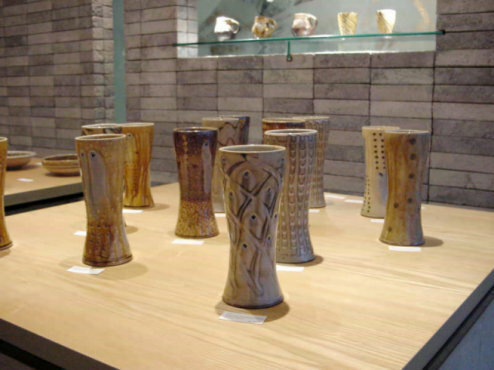 R: Well that's how it is in Mashiko, there are many potters making works that have nothing to do with Mashiko. M: Seagrove is the U.S. Mashiko equivalent. And we live outside of it and are able to look particularly at the 19th century tradition, which is what interests me of all the utilitarian wares. These pots contain aesthetic information that to me is useful and magnificent. And like old pots in Japan they have appreciated in value over time. Pots are greatly appreciated in North Carolina, not like Japan, but it's the next best place. R: So do you identify your work as Jugtown North Carolina pots? M: Well, I'm using the same materials but twist it and add to it by mixing up three North Carolina traditions; there was an earthenware tradition that relates very much to the style that Cardew made back in the 1930s in England; a salt-glazed tradition, and an ash glaze tradition of adding little bits of glass into the works. So I deconstruct different folk traditions and reassemble them into something that's my own. R: Where does a Japanese folk tradition come into play? M: That was my original starting point, falling under the spell of the Mingei movement as a young adult straight out of university. At that time I was very anxious to do something that wasn't industrial pottery. The whole Mingei ideology, the aesthetic resonated powerfully and I jumped happily out of the frying pan of industrial ceramic into the fire of Mingei and don't regret it for a minute! R: Tell me about Cardew. M: He had a different style then Leach or Hamada, it was more of a cerebral, western, very scientific approach. His book "Pioneer Pottery" details the job he placed upon himself to prospect for local materials in West Africa doing it with very scientific principles. In a way he was a cross between Gauguin, Albert Schweitzer and E.F. Schumacher of "Small is Beautiful." He was making exotic art way out in the middle of nowhere. 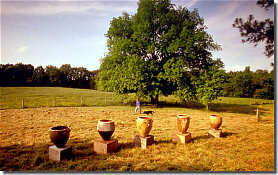 He made beautiful, beautiful pots. One of the nice things about the way he taught was with he gave students a lot of freedom. It wasn't rote learning. He gave nominal instruction; he also was an old man at that point. He let you learn at your own pace. It wasn't a production pottery, it as more like a very peculiar art school for two or three apprentices working in an atelier with a certain workshop style, yet a loose style. I'm glad that it was a style distilled throughout the world rather from a particular individual. R: Do you live with many pots from throughout the world? M: I use mostly mine! I can't afford the ones I really like, but more than that I like mine and I want to use them. But I do have many pots around made by other people. R: Do you have any Japanese pots? M: I have no Japanese pots apart from a few that were made by a young Japanese potter, Ohta Tomitaka from Kyushu who visited several years ago. R: I still can't believe this is your first exhibit in Japan because of all the connections you have with folk traditions and the links to Japan. M: I know!! I think everyone should come and see the exhibition for themselves! I think people will enjoy the twists I've given to a fairly standard repertoire of Mingei ideas and shapes. There's only a slight twist to what I make and what the Japanese market is used to. It's a challenge for myself, and also for the Japanese audience, to learn from the pots that I've made. 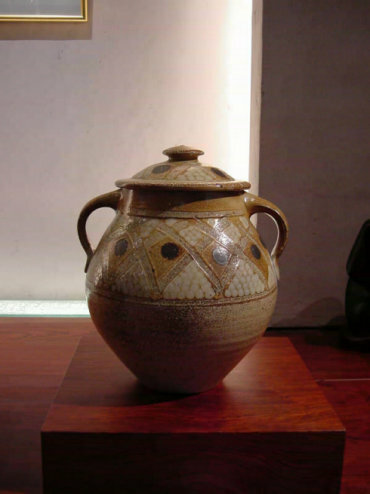 R: What techniques do you use from traditional Mingei pottery? M: One is little scraps of blue stained glass that I stick into wet clay which comes from the Lincoln county North Carolina tradition. Originally potters would stick the glass into cracks on handles or the bottom of a pot to try to seal it during firing. They quickly recognized the decorative possibilities and started adding them purely for decoration. The pitchers that I make I'm particularly fond of. Cardew is perhaps best known for his adaptation of north Devon pitchers. I like north Devon handles on pitchers, and this might be an arrogant statement, but I make very good handles! M: The Japanese handles can be nice but there's a strength to the north Devon ones and traditional English pitchers. The handles should be athletic. You should be able to pick it up and see movement. It's as difficult to pull a good handle as it is to make a good pot. You can deftly tuck your hand under a handle, and that's a very pleasurable tactile experience to have clay on the outside of your hand as well as on the inside. R: Didn't Leach teach Hamada how to pull a handle? M: Yeah, he did a terrible job! You see I'm very sensitive to the magnificence of clay objects! 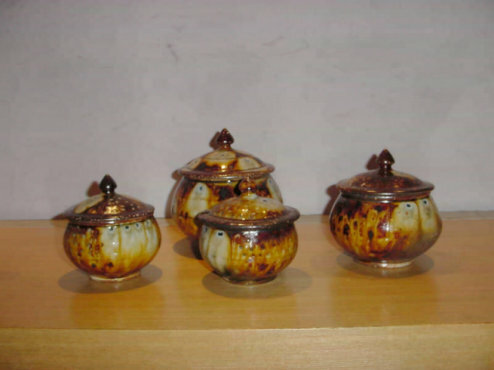 To everything about them, from the materials used, to techniques of making them, and decorative techniques, all aspects of firing and selling. You have to be a master of them all. I think it's important for me to come to Japan and place myself within this context to see how I bump up against Japan and to see how Japan bumps up against me. I have a great respect for what is going on here. The contemporary Japanese work that I see is top class. R: Thank you Mark for taking the time to talk with me and I wish you all the best on your incredible continuing ceramic journey. I can only say I think your work is top class too and very necessary for your US, and now Japanese, audience as well. M: Thanks here as well Robert.